A lot of the GI Joe filecards provide no given name for the character - usually it's been classified, or just hasn't been revealed. But usually, you get the idea that at least those people know who they are. Cobra's agents wear masks because they don't want to be identified, but they still know their own names, right? There's one guy out there for whom that may not be true. When Zartan was originally released back in 1984, his filecard didn't stop there, going on to describe him as an "extreme paranoid schizophrenic. Grows into various multiple personalities to such an extent that the original personality becomes buried and forgotten." Then Hasbro received complaints from mental health professionals, who were worried that the card suggested schizophrenia and multiple personality were the same thing. Apparently they're not. Anyway, Hasbro changed the card so it just said Zartan was "extremely paranoid," with no mention of his being a schizo. This time, they avoided the problem altogether by not including any of that info. Zartan isn't as much of a direct update as some of the other 25th Anniversary Collection figures. We're not just talking minor "only the fanboys will notice" stuff like Flint's gloves - this figure is different enough that Hasbro could release a "1984-accurate" Zartan in a later series, and people would still buy it. The major difference is the upper body: instead of an armored breastplate and spaulders over a bare torso, he's now wearing a long-sleeved shirt beneath modern-style body armor. He has the old armored plates on his upper legs, though, and his boots are the same general design, though now they look like real boots underneath armor plates. The tiny Cobra sigil on his chest is fully sculpted, and check out his skull belt buckle. The new figure's face is much nicer than the old one. His features are clearly defined, and not "soft" at all. You can really see the scowl on his face, and his ears are completely detailed, despite being tucked way back under his hood. The original figure didn't have any pupils, but this one does, and they even got the dark spots over his eyes right, for a change: for the last few years, Hasbro has been painting those as if they were one big spot, or perhaps a shadow cast by the hood; in reality, they're supposed to be separate. I don't know if they're make-up or a birthmark or what, but there are two of them. TFAC Zartan brings back one great feature that's been overlooked since 1984: color-changing plastic! Part of Zartan's story was that his mimetic abilities were cancelled out by natural sunlight, and the original figure dealt with that by having Zartan's skin turn black when exposed to UV light. This new version doesn't quite duplicate that feature, opting instead for a thermal change. It's not much, since only his face and neck are skin, but he does change color, becoming sort of bluish-green when exposed to cold. 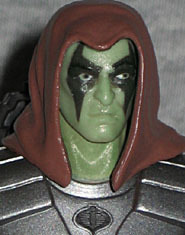 There are several different packaging variations of Zartan, each dealing with his color-changing ability in a different way: the original release had notice printed on the card; the first revision had no notice at all; and the third version had a sticker applied to the card to hype the change. These changes have led to rumors that some Zartan figures lack the color-changing ability, but that's false - all the Zartans change color, and they all change color in the same way. In his original 1984 release, Zartan was only available in a boxed set with his Chameleon Swamp Skier. Since this version is on a solo card, he certainly doesn't have quite the same assortment of accessories he did back in the day. In addition to the Cobra-logo display base with his name tampographed on the front, he has a knife sheathed in his boot (based on a sculpted element of the original figure) and an impressive rifle with a large scope. 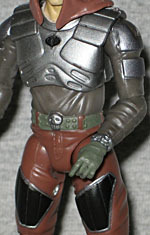 The first Zartan came with a pistol (and the armor on his chest and thighs was removable), but this one lacks all that. 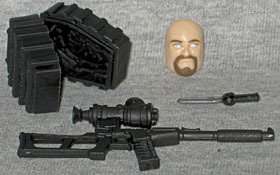 Like the original figure, he has a bearded facemask to simulate his disguise abilities, and a backpack to store it in. Unfortunately, this backpack isn't as good as the old one. While the 1984 version was sized to fit the mask and was even specifically shaped to hold it securely, this version is completely hollow inside (though detailed) and much larger than it needed to be. Plus, it latches poorly - and sice the hinge is on the top, the mask tends to fall out. The old backpack had its hinge on the side, to help prevent just that. I wrapped a clear rubber band around mine to keep it closed. Zartan was one of my earliest GI Joe figures - I had received a MotU Land Shark as a gift for either Christmas or my birthday, but it was broken. When we returned it to the local Zayre's, I chose the original Zartan over a straight exchange, and he became one of my favorite characters of the '80s. No surprise, then, that I was really looking forward to this TFAC update. The design may have changed, and the backpack my be crummy, but everything else about this figure is good. And heck, if they decide to release a "shirtless" version with his old armor and a Chameleon Swamp Skier, I'll probably get that one, too.